Does your job need you to sit in a chair and type away at the computer for long hours? Do you have backpain from continuous sitting? We recommend the OM5 for you. As you all know by now, we love the OM5 and we’re never tired of talking about it . But we’re happy to report that we’re not the only fans of this chair. OM5 is a one of a kind task chair with a unique self-adjusting mechanism. 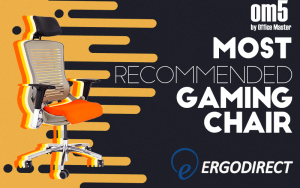 Manufactured by Office Master (OM) and designed by Francisco Romero primarily as a task chair, it was picked by PC Gamer as their recommended gaming chair in 2015. This was the way a recognized gaming authority introduced healthy ergonomic practices into gaming. What’s Inside called OM5 the coolest office chair and furnished their new office with OM5. OM5 has a unique proprietary design called “Body-Activated Motion,” defined by OM as a patented recline action, which has the backrest and seat working in unison so that the backrest is a lever for pushing the body’s weight “uphill,” removing the need for manual tension adjustment. 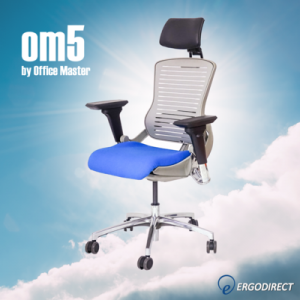 Melissa Afterman, an ergonomist, called the OM5’s design having intuitive adjustability. In simple words, the OM5 does all the work to adjust to your unique body type. You don’t have to fiddle with knobs, lever and go under the chair to figure out the mechanism. Except the height adjustment lever, there is no adjustability on OM5. However, as you recline in the chair, the seat pan automatically comes forward. The self-adjusting mechanism automatically adjusts “seat pan” and “back support” to the perfect angle and position for your comfort as you move backward and forward in the chair. 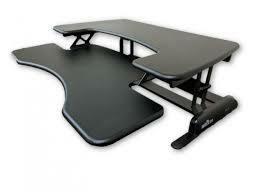 It provides effective lumbar support for your lower back no matter if you sit up or lean back on the chair. Ergonomics 101 recommends against staying in the same position for a protracted period of time. This advisory especially needs to be heeded by those whose job is tied to a computer, chair and a desk. The OM5 is a chair made in heaven for desk jobs because it motivates and allows you to change position frequently. Reclining in the OM5 is the only stimulus needed. Encouragement to move frequently as well as the continuous lumbar support is the solution for chronic back pain. This OM5 self-weighing body activated mechanism encourages good posture by design – not by forcing you into a “locked” position. If you remember to sit all the way in the back of the chair, without pre-emptively trying to tilt the back, the chair and back will do all the work for you. Since the mechanism is designed to have seat and back pan in coordination, they provide perfect support at any posture (sit up or lean backward and as far as the user sits all the way back on the chair). The flex-back flexes to your back, the seat will do adjustments for you. It’s a completely different way of thinking about chairs but is one we find grows on you the longer you use it. So, it’s all about how you sit on OM5. In other words the rear end of user needs to be pushed back all the way far behind, where the seat pan meets the seat behind. This gives a perfect posture and supported position. 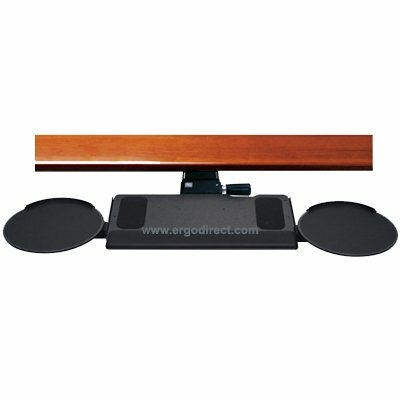 As mentioned earlier, this particular chair was designed to be self-weighing and respond to a wide range of body weights and sizes without needing manual tension adjustments. As such, the tension was not designed to be adjustable. The back is intended to go back intuitively and this is not a chair that is normally recommended for people who, for example, frequently want to maintain an upright posture. 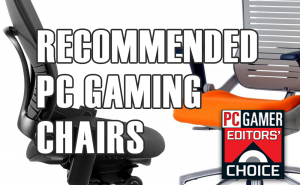 Why a self-adjusting chair versus manually adjustable chair? Most of the chairs on the market today are manually adjustable. These chairs easily have up to ten control levers like pneumatic lift, tilting backrest, back height adjustment, rocking tilt, seat depth adjustment, lumbar control knob and so forth. All this is great if you love to tinker and fidget and find gadgets and the associated technology fascinating. Not so much if you find knobs and levers challenging and irritating. OM5 scores hands down on the adjustment front. Now say you are a gadget geek and you have just received your manually adjustable chair. You eat up the manual and arrive at a setting to give you the best possible comfort. But please note that these adjustments however flexible and fancy will lock you in the desired position till you go back and manually re-adjust. 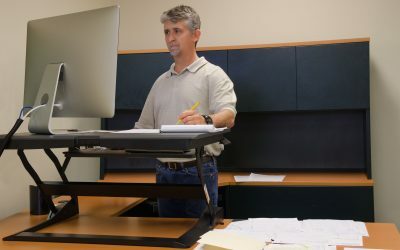 This locked position coupled with a desk-tied job inhibits movement – an ergonomic no-no. 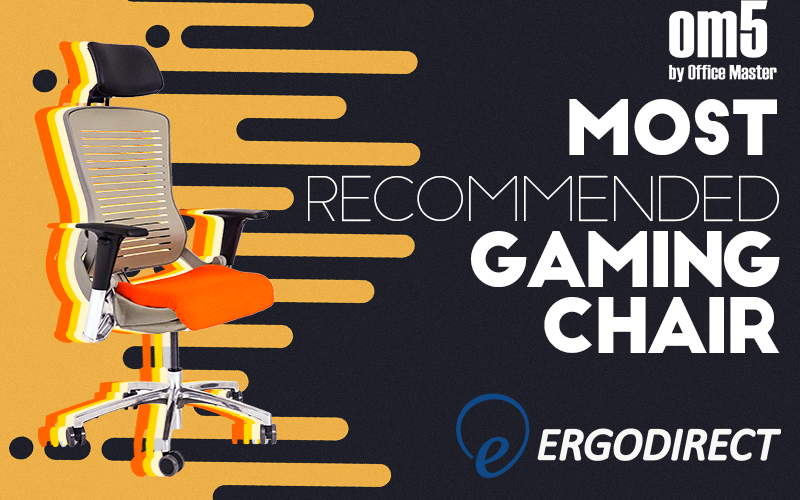 One would hardly manually re-adjust the chair several times a day in order to achieve an ergonomic posture. OM5 chairs are custom made and with a wide variety of options on our website, we give you the ability to build your chair as per your preference.